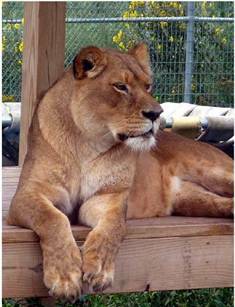 Wildlife Watch will never forget the large cats that our donors allowed us to rescue from the Catskill Game Farm. There were so many pitfalls during those days, including where they would or could go. Time has borne out the fact that we and the cats were carefully guided by a power that had only blessings in store for them. This is a story of intervention in what would otherwise have been a dismal future for them. We are forever grateful to our donors, and to The Wildcat Sanctuary for providing these precious beings with THE BEST forever home. We hope you enjoy this follow-up. chasing their neighbors, the tigers Titan and Lilly along their enclosure wall. While Titan is not impressed, Lilly believes she could take them all down, possibly in one swipe. One of the first things done at TWS when a new animal arrives is an intake exam. This includes drawing blood, doing a full physical, spay or neuter and inserting a microchip. Before the lions arrived we knew we needed larg­er equipment for veterinary medicine. We already had two big cats but with the fast approaching arrival of Aslan's pride, the pressure was on. We obtained a stainless steel table for sur­gical procedures and an x-ray machine that both accommodate up to 500 pounds and also a larger anesthesia machine. Asha and Shanti Deva need­ed to be spayed so the new equipment was put to the test and passed with flying colors. 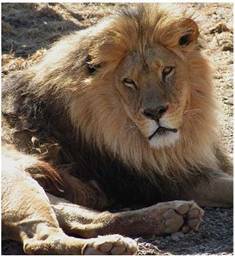 We chose to leave Aslan intact since neutering a male lion causes them to lose their mane. Since the spays, the lions have not needed any veterinary care that would need sedation, thankfully. However, a new adventure for the keepers was getting the lions vaccinated without having to sedate them. Due to the new found trust in the keepers this procedure turned out to be fairly simple with a hand injection or small blow dart. they perform full physicals every three years, including taking blood work, help us vaccinate, and are at the ready should a resident become ill or injured. All of their services are donated and we could not do it with­out them. We have learned many new and surprising things about veterinary medicine in exotic cats. We surely will continue to strive to provide excellent care for all of our residents whether they are great or small.